The South Eastern Railway never intended that the Sandgate branch would serve either Hythe or Sandgate. Their sole purpose for building the line was to eventually extend it to Folkestone Harbour, thereby creating an easier and more convenient route to the continent for its passengers from London. On opening of the branch in 1874, buses running between Hythe, Sandgate and Folkestone met each train at the inconveniently sited stations, but local people were not happy with the arrangements and were soon demanding better local public transport. The first tramway between Hythe and Folkestone was proposed in 1879, just five years after the branch opened. The proposal was not well received by local tradesmen who feared a loss of business to Folkestone, and by some residents along the route who feared that the tramway would cause property values to decline. To overcome these objections a shortened route from the bottom of Sandgate Hill running along the seafront to Hythe was proposed in 1880. The first tramway to be laid was to carry materials used in the construction of the sea wall. 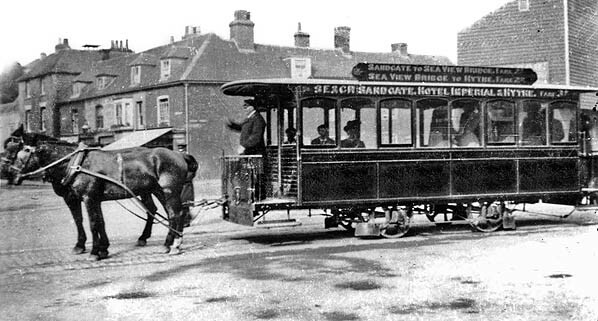 Once this had been completed, the tramway was left in situ and, at an SER board meeting in April 1881, Chairman Sir Edward Watkin suggested that it should be purchased and extended with a passenger service being provided between Hythe station, the town and the recently opened Seabrook Hotel which was owned by the SER. The steep gradient between the town and the station ruled out horse traction and Watkin's proposal was not adopted. In autumn 1883 the nominally independent Folkestone, Sandgate & Hythe Tramway Co Ltd was formed by a group of local businessmen. The SER was keen to be involved and presented the new company with an estimate for building the tramway. The FS&HT Act was passed on 28 July 1884 authorising the SER to work, use, manage and maintain the tramway using horse traction. Tramcar No.3 which was generally only used in the winter. The tramway was divided into four sections which, once completed, would operate as a single line. Section 1 ran from the south side of Hythe station, where there would be a physical connection with the SER. It crossed the main Hythe - Sandgate Road and the Royal Military Canal, terminating in Princes Parade. Section 2 ran from the Seabrook Hotel along the length of the parade as far as the junction with the Hythe - Sandgate road, near Sandgate station. From here section 4 took the line along the seafront to Seabrook and on to the west side of Sandgate, with a spur to the up sidings at Sandgate station where there would be a second physical connection with the SER. The final section 3 took the line to its terminus at the base of Sandgate Hill. Section 4 had been authorised by the 1884 Act, and a further Act of 1886 authorised the building of sections 1 - 3. Work on laying sections 1 and 2 started that year with the construction supervised by the SER's chief engineer Francis Brady, mainly in his spare time as he was already heavily committed to the construction of the Elham Valley line. Once this had been completed, construction of sections 3 and 4 started in 1888. As the Elham Valley line was now nearing completion, Brady was unable to devote further time to the tramway so a local contractor Mr J Jeal was employed; he had previously undertaken work for the SER in the area. 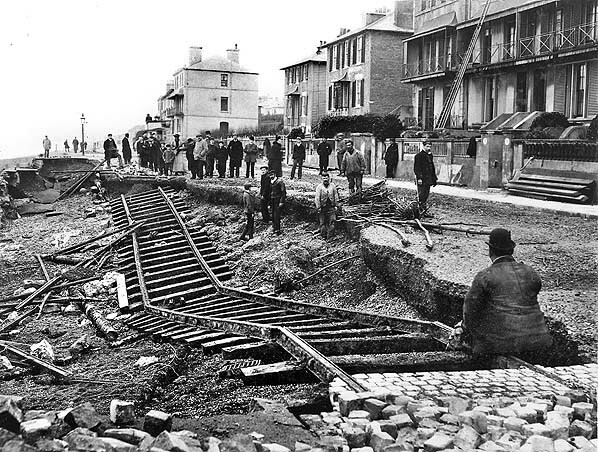 A severe storm in February 1899 caused the sea wall to break up over a considerable distance leaving the tram tracks suspended in mid air. As sections 3 & 4 were progressing, the completed sections 1 and 2 were inspected by Major General Charles Hutchinson, the Board of Trade's Inspector of Railways. The Major General refused to sanction the opening of the tramway for a number of reasons including the fact that all of the first section and much of the second had been built by Brady as a conventional railway rather that having rails level with the road as required by the 1870 General Tramways Act. As the Elham Valley line had now opened, Francis Brady was able to deal with the Major General's list of modifications. Some of these were never undertaken as the steep gradient between Hythe and the station would never carry passengers and was therefore exempt from the Act. Further parliamentary authority was, however, required to comply with some of the required changes. With the first two sections now ready for opening, work on the extension came to a halt at Sandgate in September 1889 when influential local landowner Lord Radnor exercised a power of veto that had been included in the 1886 Act. He wanted to restrict the gauge to 3ft 6in as anything wider would, he claimed, restrict the flow of traffic through the narrow streets. He was also concerned that the company was planning to use steam traction in contravention of the Act. Tramcar 1,2 or 4 has just left the Sandgate terminus and is heading east along the High Street towards Hythe. The junction with Military Road is seen on the left. The tramway company confirmed its intention to apply for authority to extend it west into Folkestone which incensed Lord Radnor even more. 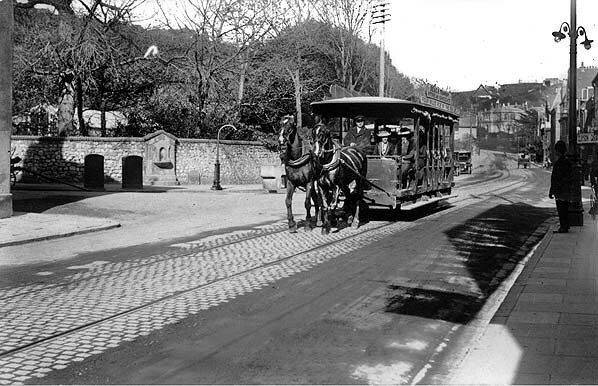 In February 1890 Folkestone town council approved the extension of the tramway into the centre of the town, being well aware of the benefits the new route would bring, but the SER was concerned about the difficulties presented by the steep climb into Folkestone as well as Lord Radnor’s promise to oppose the scheme on the grounds of objections from his tenants along the route. 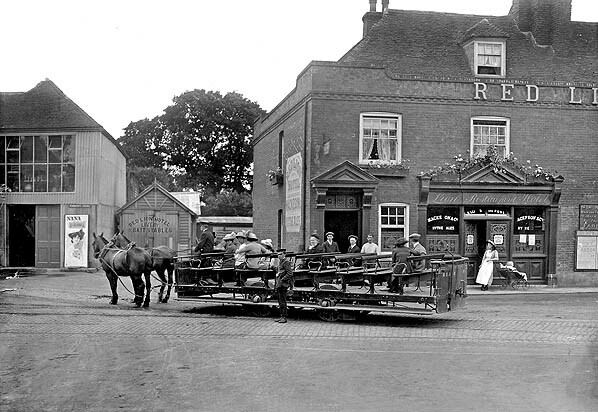 Car No.1 is seen outside the Royal Oak pub at the terminus at the bottom of Sandgate Hill. To avoid inflaming the situation further, the SER postponed any further parliamentary Bills and continued with the tramway as already authorised to the bottom of Sandgate Hill, which had now been agreed with Lord Radnor. There was still, however, confusion as the SER was under the impression that the agreement was for a standard gauge line while Lord Radnor still insisted that the extension must be to the narrower 3ft 6in gauge. By 10 May 1890 work was once again underway and made rapid progress. The row between Lord Radnor and the SER board rumbled on, however, and eventually Sir Edward Watkin was so incensed by Radnor's opposition that he threatened to ‘pull the plug’ on the whole tramway unless there was an amicable resolution. Despite this impasse, two tramcars, Nos 1 and 2, were ordered by the SER in September 1890 in anticipation of the tramway opening in the near future. Despite lengthy communications between the two sides there was no resolution by early 1891, and Sir Edward Watkin came to the conclusion that Lord Radnor would never change his mind; Watkin consequently instructed J Jeal to begin lifting the rails in section 3. There now seemed little point in delaying the opening of the remainder of the tramway between the Seabrook Hotel and the outskirts of Sandgate, and public trams began operating on 18 May 1891. Car No.5 'The Toast Rack' is seen at the Red Lion Square terminus at Hythe shortly before departure for Sandgate. Conductor Harry Jago is seen standing in the road to the right. Despite the opening of the tramway, behind the scenes the arguments between the SER and Lord Radnor raged on. Eventually the SER agreed to relay the extension to 3ft 6in gauge and lay a third rail along the rest of the tramway to the Seabrook Hotel to allow narrower gauge trams to use the whole line. At the west end of the tramway there were no problems with intransigent landowners, and two new lines were proposed. One would extend the route from the Seabrook Hotel for 2,008yd to a new terminus at Red Lion Square, but a further 1,540yd extension to Pennypot was deferred. The standard gauge Red Lion Square extension was inspected by Major General Hutchinson and opening was sanctioned, with trams running over the new line on 1 June 1892. The 'Toast Rack' passes the tram shed as it arrives at the Hythe terminus; one of the covered trams is seen inside the shed. The stables and tramway offices are located in the building behind the shed. Following the opening of the western extension, Lord Radnor had a surprising change of mind about allowing standard gauge trams into Sandgate; no reason was given nor has any come to light since. At this time however, the Sandgate Hill lift was under construction, and its lower station was only a short walk from intended Sandgate tram terminus. The land over which the lift would run was leased from Lord Radnor who would receive a royalty of 2½% of the gross takings over £1,000 per annum. It may be that Lord Radnor felt he would be doing himself out of potential income as the lift would rely on the tramway to provide the majority of its passengers and hence its income. The SER and Lord Radnor signed a binding agreement on 14 July 1892, the SER agreeing not to electrify the tramway at a future date using unsightly overhead cables. Restoring the tramway to standard gauge and completing it to the bottom of Sandgate Hill proceeded rapidly, with the first tram running over the line on 30 July 1892 and a full public service running on Sunday 1 August, exactly two months after the first section opened. There was a half-hourly service with a twopenny fare in each direction. This was reduced to an hourly service during the winter. The tramway was well used during its first year with a dividend of 6% being paid to shareholders. 110,000 passengers were carried during the summer season. 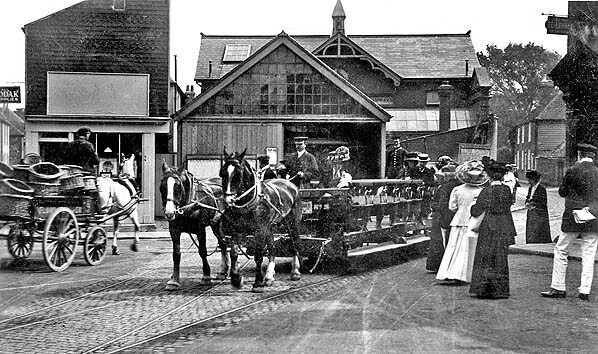 A property close to the Red Lion terminus was purchased as a suitable location for a tram shed and stable, which was built on the site in 1894. Two more tram cars, Nos 3 and 4 were built by the SER at their Ashford works later that year. 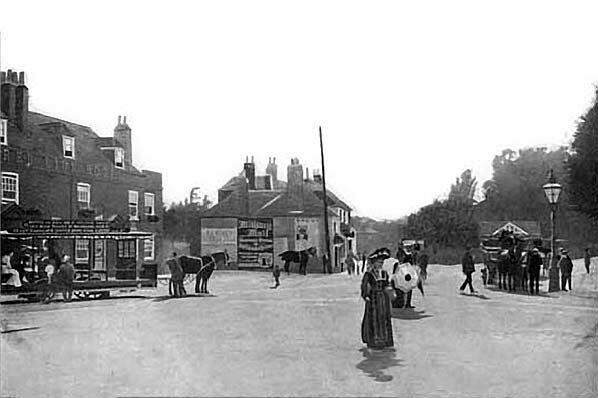 In 1898 a separate stable was built in Rampart Road, Hythe. 1898 1:2,500 OS map shows the Red Lion Square terminus in Hythe; also shown are the tram shed and adjacent stable and offices. The South Eastern Railway Act of 29 June 1893 authorised the railway to take over the operation and maintenance of the tramway. For the summer season of 1897 the SER built a fifth car (No.5) which was little more than two rows of seats on a flat wagon and known as the 'toast rack'; it was designed to give passengers the best opportunity to enjoy the ride on a hot summer day. 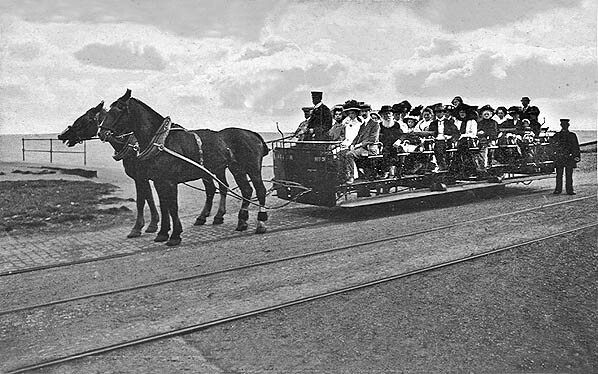 Following the success of the tramway, the SER revived its attempt to reach Folkestone. 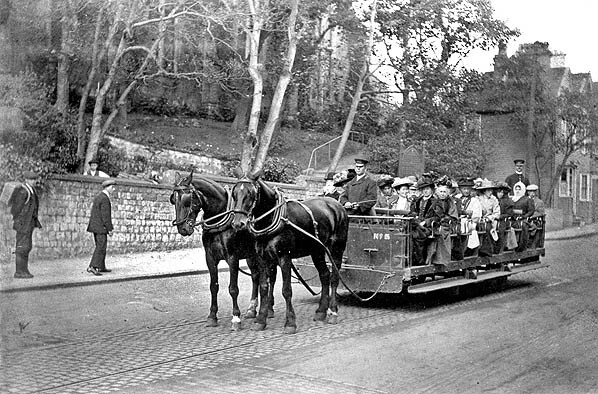 Having signed an agreement with Lord Radnor stating that the tramway would not be extended beyond Sandgate Hill, the proposal this time was to operate a horse-drawn omnibus service between Sandgate and Folkestone. In later years the SER's successor, the Southern Railway, took the omnibus to its heart, much to the detriment of its rural branch lines. One bus was ordered that could carry 10 or 12 passengers inside (depending on the weather), 11 on top and a further 4 on the box with the driver. The SER's bus service was, however, very short-lived and in January 1899 the bus was sold to Hythe, Sandgate & Folkestone Omnibus Co. Car No.5 at the Hythe terminus in Red Lion Square awaiting departure for Sandgate.e c1912. Driver James Pilcher is in charge. By 1900 the tramway service consisted of sixteen journeys each way, with eleven on Sundays. The 1870 Tramways Act, in granting powers for private bodies to build and operate tramways, provided a clause to enable local municipal corporations to compulsorily purchase the tramways within their district after 21 years had elapsed, if they so wished. At this time, many horse-drawn tramways were being upgraded to electric traction which offered a faster service. This had first been proposed for the Hythe & Sandgate tramway in 1893, just seven years after it opened. Following objections about the unsightly overhead electric power lines this proposal came to nothing, as did a more ambitious scheme for a new electric tramway from Folkestone to Hythe in 1897; this was quickly scuppered by objections from Lord Radnor, as were later schemes. The unexpected death of Lord Radnor at the age of 59 in 1900 brought no change as his son shared his late father's views. There were, however, soon numerous schemes for new electric tramways between Folkestone and Hythe, and Lord Radnor eventually had to accept that a tramway to Folkestone might be built; but he indicated if this did happen, he would prefer it to be built by the Corporation rather than a private company. 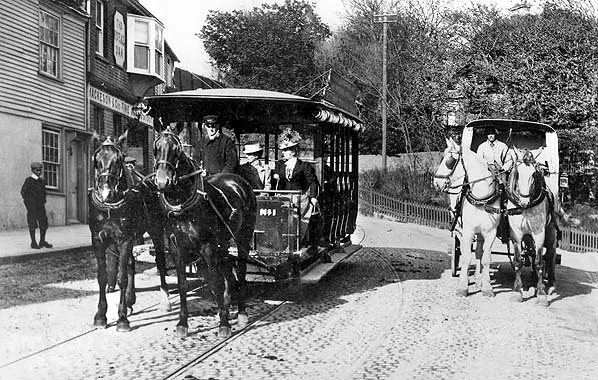 In 1905 the 1884 Act, which allowed the construction of the length of tramway through Sandgate (section 4), was 21 years old, so the clerk of Sandgate Urban District Council, notified the South Eastern & Chatham Railway that the council intended to claim power under the enactment (Tramways Act, October 1870 Sec. 43) to compulsorily purchase that section of the tramway. Sandgate Council made no secret of the fact that it intended to hand over the tramway to one of two companies competing to build a new tramway: each already had a Bill going through Parliament. The SE&CR had no option but to agree to sell to Sandgate Council as required by law. Car No 5 waits at the Hythe terminus in Red Lion Square awaiting departure for Sandgate. As soon as the new Lord of the Manor was made aware of the impending sale he immediately instructed his solicitor to write to the Board of Trade to inform them that he intended to present petitions against each of these bills and instruct the SE&CR to actively oppose them in compliance with their agreement of 12 July 1892. The SE&CR was now in the impossible situation of being obliged to oppose a sale they had to proceed with simply because of the 1892 agreement which required them to object to electrifying the tramway using overhead wires. In an effort to break the stalemate, one of the companies, the National Electric Construction Co Ltd, decided to opt for the Dolter surface contact system and in 1906 obtained a Light Railway Order for a 13-mile line. With no option other than selling section 4, the SE&CR took the decision to sell the whole tramway to the NECC for £20,000; this included all lines, plant, horses, rolling stock and premises. It now seemed likely that Folkestone would at last get an electric tramway, but it was not to be. The NECC had already employed the Dolter system of stud contact power supply on the Mexborough & Swinton Tramway in Yorkshire, however it proved unreliable. The studs in the road were supposed to be live only when the tram passed over them but they sometimes failed to operate correctly, causing a failure of power to the tram’s electric motor. Sometimes, however, the studs remained dangerously live, with possible dire consequences for those pedestrians and horses unfortunate enough to tread on them unwittingly. 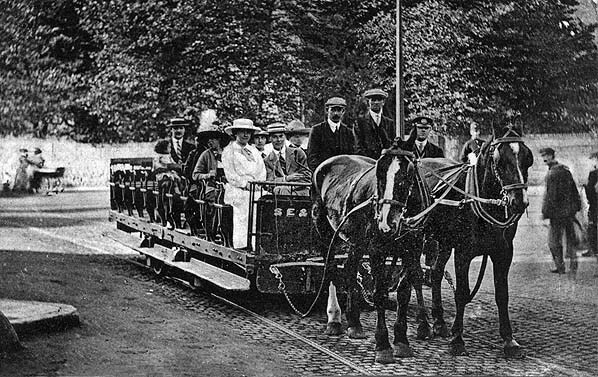 The 'Toast Rack' has stopped and the passengers and conductor pose for the photographer on Princes Parade in 1910. Once it was clear that this system could not be used, the NECC attempted to introduce a Bill in 1909 to substitute overhead cables but the SE&CR, still bound by the 1892 agreement, told the NECC that they would be unable to go through with the sale. The NECC had paid a £2,000 deposit for the tramway, but as they had not paid the outstanding balance this was forfeited and the tramway remained in railway ownership; Folkestone never received its electric tramway. The Hythe & Sandgate tramway continued to operate much as before, popular in summer, quiet in winter and frequently suspended owing to bad weather.